Overtraining- what do lactate curves tell us? In a cyclist ,competing at national and international level, submaximal lactate concentrations were initialy interpreted as improved endurance capacity. However,2 weeks later, a test in which maximal lactate was measured showed that maximal lactate was decreased as well. Together with the complaints of deteriorating perform- ance and subjective complaints of iritability and sleep disturbances, overtraining was diagnosed. After decreasing the training load, performance was gradually restored. This example indicates that athletes should be carefully questioned on their ability to perform their regular training programme, their motivation, possible sleeping disorders and eating problems. This case serves as a reminder to interpret lactate curves carefully and shows how important it is to obtain maximal lactate from a graded exercise test. Over training is frequently observed in sport practice. Many athletes suffer from a decreased, or lack of, improvement in performance even though they continue their regular training programme. The only adequate therapy, which is feared by most athletes, is a drastically reduced or zero training programme. The diagnosis is often difficult because of the lack of appropriate indicators or misinterpretation of test results, as will be seen from the case report below. An amateur cyclist (19 years, 64kg) competing at national and international level consulted a sports- physician with the complaint that he had problems during the last hour of the classics (180-km road races). Whereas previously he could normally finish with in the first group, he now finished in one of the chasing groups or did not finish at al. Blood was collected and analyzed for as part at aminotransferase (ASAT), lactate dehydrogenase (LDH), creatine kinase (CK), redblood cels(RBC), haematocrit (Ht), haemoglobin (Hb) and feritin. There was a slight, but not pathological increase in the concentrations of muscle enzymes. RBC, Ht, Hb, and feritin were in the normal range. An exercise test was performed on a cycle ergometer in the laboratory and lactate concentrations were measured at the end of every stage (2.5min according to Kuipers’). The test was aborted at 350W because the 4mmol -h-point had been exceeded (4.1mmolh-1 at 350W). The lactate concentrations were compared with the results of a maximal test conducted 2 months earlier. 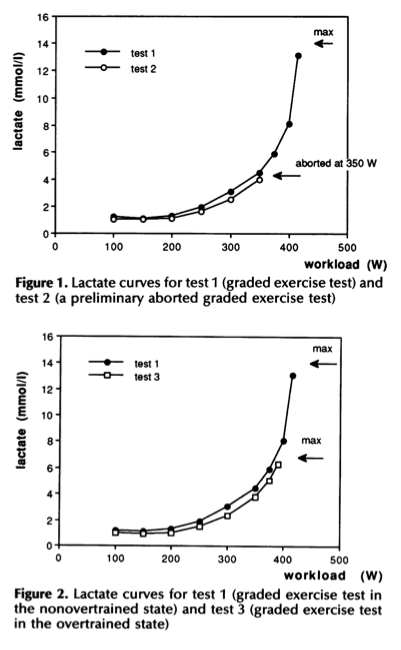 Results of these two tests are shown in Figure 1.The lactate curve was shifted to the right and it was concluded that the cyclist was in good physical condition. Because problems occurred predominantly during the later stages of the races the advice of the sports physician was to include a 4-h endurance training session in the weekly training programme. The cyclist reported to our laboratory 2 weeks later with the same complaint. From his medical history it appeared that the cyclist had some sleepingproblems and was irritated more frequently than normal. An exercise test was performed til exhaustion and plasma lactate was measured. Results of this test and the results of the first test are shown in Figure 2. Overtraining was diagnosed on the basis of the test results and the medical history. We advised the cyclist to rest and to avoid interval training for 2 weeks. Performance increased gradually and after 3 weeks he was again able to finish within the first 20. Overtraining is a general term for a situation in which there this imbalance between exercise and recovery. When this imbalance is continued for 7-10 days it can lead to a variety of symptoms including disturbed nervous, endocrinological and immunological function. In the literature this type of overtraining is called short-term overtraining or over-reaching. In this situation supercompensation is possible although recovery requires a longer time than in a normal regeneration period. When such athletes continue their training, they may eventually end up with an overtraining syndrome or staleness. Supercompensation will not occur and a long recovery period is needed. Because of many practical and ethical problems little research on overtraining has been performed and most studies are anecdotal or use results from cross-sectional studies. None of these studies has identified clear indicators of overtraining. One of the proposed markers of overtraining is a paradoxical decrease in plasma lactate levels in sub maximal and with caution maximal exercise. While lower lactate levels during submaximal exercise generally indicate improved endurance capacity, in overtraining, paradoxically lower maximal and submaximal lactate values have been reported. In our laboratory a study was performed to investigate the physiological responses of well- trained amateur cyclists to a 2-week period of high intensity exercise, in an attempt to find diagnostic markers of overtraining. One of these parameters was lactate measured during a graded exercise test. After 2 weeks of extremely heavy training (13 intensive interval training sessions of 2-3h in 15 days) maximal as well as submaximal plasma lactate concentrations were decreased. The maximal lactates dropped by up to 50%. It is not clear why this drop in plasma lactate occurs but there are a few possibilities. Training may have improved lactate clearance. Although this possibility cannot be excluded, a drawback to this might be that in our earlier study the lactate concentrations increased again after 2 weeks of reduced training. Second, the reduced lactate concentrations may be caused by the decreased muscle glycogen found after repeated strenuous exercise bouts. However, in a recent (over-reaching) study at our laboratory with the identical experimental design to our previous study, it was observed that the plasma lactate levels were also decreased when carbohydrates were supplemented after the training bouts and high muscle glycogen concentrations were maintained (unpublished data). The third possible explanation is a decreased sympathetic drive or a reduced catecholamine sensitivity. Catecholamines have an important regulatory role in glycogenolysis and reduced sensitivity to catecholamines or lower plasma catechol- amine concentrations could result in a decreased lactate production .This view is supported by results from a study by Lehmann who observed decreased catecholamine levels after intensifying the training of runners. However, additional prospective studies have to be performed to obtain information regarding the underlying mechanisms of reduced lactate concentrations in overtraining. 1 KuipersH,VerstappenFTJ,GeurtenP,VanKranenburgG. Variability of aerobic performance in the laboratory and its physiologicalcorrelates.IntJSportsMed 1985;6:197-201. 2 KuipersH,KeizerHA.Overtrainingineliteathletes:review and directions for the future. Sports Med 1988; 6: 79-92. 3 Morgan WP, Brown DR, Raglin JS, O’Conner PJ, Ellickson KA. Psychological monitoring of overtraining and staleness. BrJSportsMed 1987;21:107-14. 4 Barron GL, Noakes TD, Levy W, Smith C, Millar RP. Hypothalamic dysfunction in overtrained athletes. J Clin EndocrinMetabol1985;60:803-6. 5 DerevencoP.FloreaE,DerevencoV,AnghelJ,SimuS.Einige physiologische Aspecte des Uebertrainings. Sportartzt und Sportmedizin1967;18:151-61. 6 DressendorferRH,WadeCE,SchaffJH.Increasedmorning heart rate in runners: a valid sign of overtraining? Physician andSportsMedicine1985;13:77-86. 7 Kindermann W. Das Ubertraining: Ausdruck einer vegeta- tivenFehlsteuerung.DeutscheZeitschriftfirSportmedizin1986; H8: 138-45. 8 FosterC,SnyderAC,Thompson,NN,KuettelK Normaliza- tion of the blood lactate profile in athletes. Int J Sports Med 1988;9:198-200. 9 JacobsI.Bloodlactateimplicationsfortrainingandsports performance. Sports Med 1986; 3: 10-25. 10 JeukendrupAE,HesselinkMKC,SnyderAC,KuipersH, KeizerHA. Physiologicalchangesinmalecompetitivecyclists aftertwo weeks ofintensifiedtraining.IntISportsMed 1992; 13:534-41. 12 Brooks GA. Current concepts in lactate exchange. Med Sci SportsExerc1991;23:895-906. 13 LehmannM,BaumgartlP,WiesenackC,SeidelAetal. Training-overtraining: influence of a defined increase in training volume vs training intensity on performance, catecholamines and some metabolic parameters in experi- enced middle- and long-distance runners. Eur I Appi Physiol 1992; 64: 169-77. This entry was posted in Reviews, Training and tagged Cycling Endurance exercise engineering Fatigue Profiling Heart Rate Monthly Testing Protocol Orthostatic Heart Rates Power sports and exercise engineering sports engineering Sports Exercise Engineerin, Endurance, Fatigue Profiling, Lactate, Monthly Testing Protocol, Overtraining, principles of training, sports and exercise engineering, Sports Exercise Engineering. Bookmark the permalink.